It looked like a Bolete (porcini), it smelled like a Bolete, but I’m not expert enough to be certain so I won’t eat it. 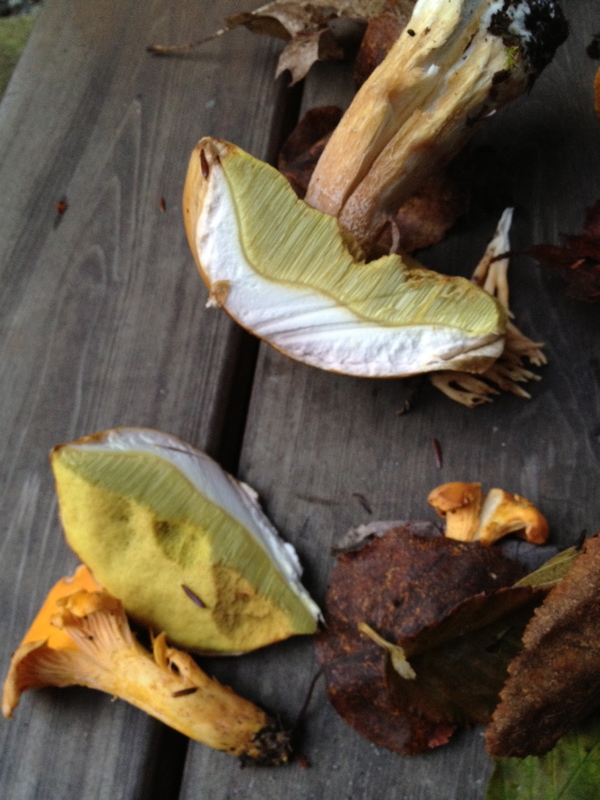 There’s too much potential for error given the 100-some Boletes out there. Black trumpets, however, I can confidently identify. NOTE to readers: I can’t identify this mushroom. CONSULT AN EXPERT BEFORE CONSUMING. Thought I found Chanterelles too, but they were smaller than ones from Pacific Northwest. I’ve lost my confidence. 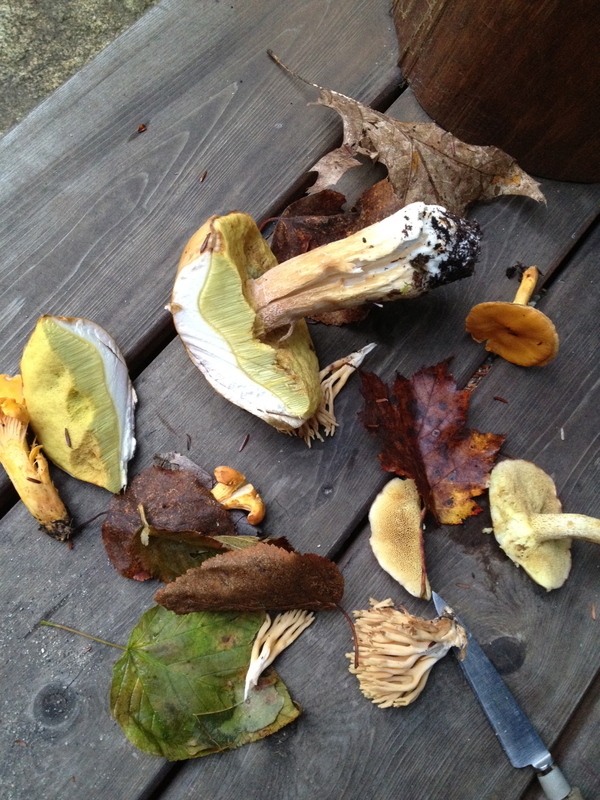 I’ve decided wild mushroom foraging will be the new foodie thing I throw myself into here in Maine. Many species seem to thrive in the damp, pine needle-carpeted forests here, and I’m eager to learn more about them. I’ve got black trumpets down. They’re easy to identify as long as you keep looking down, as “Mushroom Maineiac” David Spahr advises. Here, they spring up next to green moss and bright pine seedings. 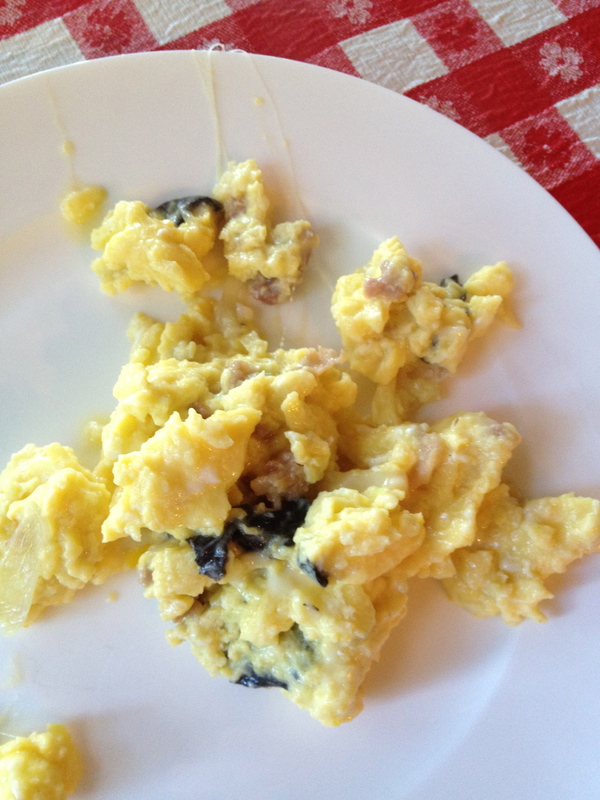 We just settled on truffled eggs with the few black trumpets I found. My Dad is a master in the kitchen! He swears by the more affordable white truffle oil from Micucci’s in Portland. Now, I’m in hot pursuit on a hike. I understand how hunters and fisherman feel. Even if you have to throw your catch back, there’s still the thrill of that “aha!” moment of discovery. I had that in the woods yesterday, chancing upon what I thought were small Chanterelles and a big Bolete that sure looks like a Porcini. We consulted friends and David Spahr’s book. I had been inspired by a display at this weekend’s MOFGA Common Ground Fair. In some ways, the more I read, the more pictures I viewed, the more doubt crept in. It just isn’t worth the risk unless you’re sure. I’ll think about joining the Maine Mycological Association and going out in the company of experts soon. The nearby Long Branch School in Bowdoinham organizes monthly forays. Trouble is, you get the most bang for your wild mushroom buck if you go out on a secret mission, and lose yourself in the woods alone. The harvest I’m abandoning due to lack of certainty. One is at least definitely a Chanterelle but the uncertainty about the lot has made me lose interest. Also found coral mushrooms we could eat, but they aren’t culinary gems and can have a laxative effect on some folks.